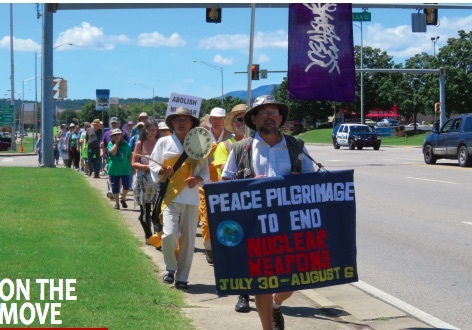 Quite a year—OREPA members rose up to meet the greatest financial challenge in our 30-year history, raising more than $50,000 in less than 60 days to fund a lawsuit to stop the Uranium Processing Facility nuclear bomb plant planned for Oak Ridge. It was the year that we traveled to Germany and came to a new collaboration with colleagues in Europe who are aggressively resisting the deployment of US nuclear weapons in five countries there. It was the year we went to the United Nations to help lead a workshop on US nuclear weapons production and participate in the initial negotiating stages of the Treaty on the Prohibition of Nuclear Weapons—it was exciting and humbling to watch the deliberations and realize history was turning before our eyes because of the courage of the delegates and the leadership of Costa Rica’s Elayne Whyte Gómez. It was the year we turned our eyes to the future with determination to develop a new generation of leaders in the struggle to abolish nuclear weapons as we began to implement the goals of our Next Generation Leadership Fund. And we maintained our on-line presence; celebrated the conclusion of the 18th year of uninterrupted Sunday vigils at the Y12 Nuclear Weapons Complex by launching year 19; published the Reflection Booklet; kept our staff and our bills paid; took seven people to Washington, DC, to oppose the UPF bomb plant in meetings with Congress and Administration officials; and worked with our colleagues in the Alliance for Nuclear Accountability to develop and carry out strategies to oppose new bomb plants and new bombs while we advocate for responsible policies for nuclear waste and cleanup programs. Oh, yes—we also sued the National Nuclear Security Administration and celebrated the Nobel Peace Prize going to the International Campaign to Abolish Nuclear Weapons. Most important of all—not one bit of OREPA’s work this past year would have been possible without the persistent, amazing support of our members. Many of you not only sent money, but wrote letters to the editor, pressured your elected officials, invited OREPA to make presentations, held fundraising events for the lawsuit, and educated yourselves about the trillion dollar plan to “modernize” the US nuclear arsenal. So our year-in-review closes with a huge Thank You to everyone who took part in this grand year.